Maybe you’ve taken to keeping all of your passwords the same, so you can remember them. Or even worse, maybe you’ve started to write down all of your passwords in one spot. Besides violating every common sense rule about data security, how does one manage all of these passwords? With today’s discount software promotion, abylon KEYSAFE! abylon KEYSAFE lets you manage all of your passwords, either with a master password or by using a physical key. With abylon KEYSAFE, you can safeguard all of your passwords using two different encryption methods, and all you need to do is remember one master password. Want to be even more secure? Use abylon KEYSAFE in combination with a physical key to unlock access to your passwords in the form of a USB flash drive, a CD, a chip card, or a certificate! 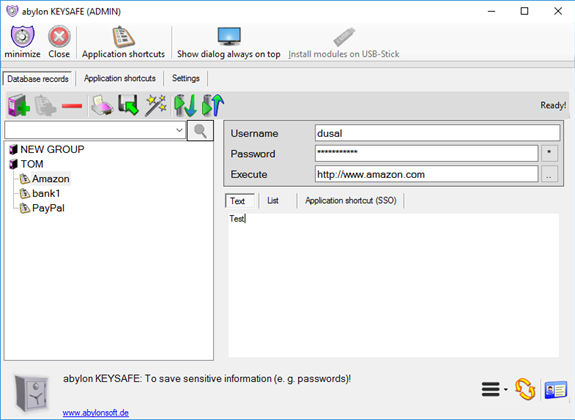 No matter what method you use, abylon KEYSAFE lets you fill in passwords in browser forms or dialog boxes just by dragging and dropping them. Best of all, you can use abylon KEYSAFE to generate random passwords, which are the safest ones of all! The USB version for mobile use has been optimized. After you purchase abylon KEYSAFE it may be used indefinitely. abylon KEYSAFE is licensed per computer, and not per user. You must install/register the software within 3 months, and cannot do so afterwards. Fred Thank you Constanin, it did come through. Thomas Klabunde @Frank: Sorry, but we currently do not support Android. In the abylon KEYSAFE dialog on the "Settings" page via the grey gear wheel icon (Advanced Settings). If this is not displayed, it is hidden. It can be selected via the pull-down menu on the right side of the icon bar. Or the dialogue must be broadened a little. Note: The abylon KYSAFE cannot open a 2nd instance. It therefore closes immediately after a new start. If it is not yet open, it can be that it is only displayed as a task icon (next to the clock). XM Thanks, Thomas. Resolved. Very helpful. Noggin The Nog Are you not able to comment on my experience of Outlook crashing when I attemtp to send an email via Cryptmail? I have had to complete an urgent mission today and I am only now coming to an answer. I am afraid that whenever I tried to send encrypted mail using Cryptmail, Outlook crashed. This was not linked to my using the Yubikey, since it also happened when I had set the encryption method to password. It would be of interest to me if it worked, since there seem to be few products that store in unencrypted form email sent in encrypted form. >> This could be because a 32-bit version of Outlook is often installed on a 64-bit operating system. Our software detects the operating system and installs the appropriate version on the computer. 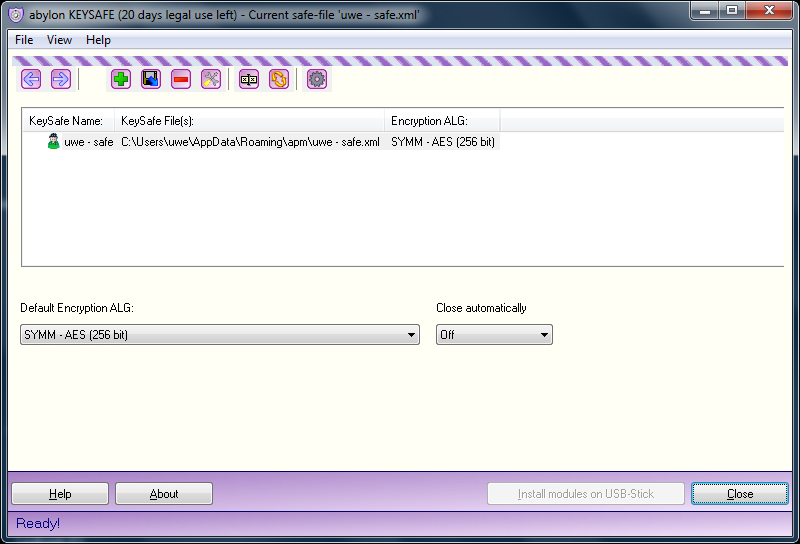 However, a 64-bit dll causes a crash in a 32-bit program. 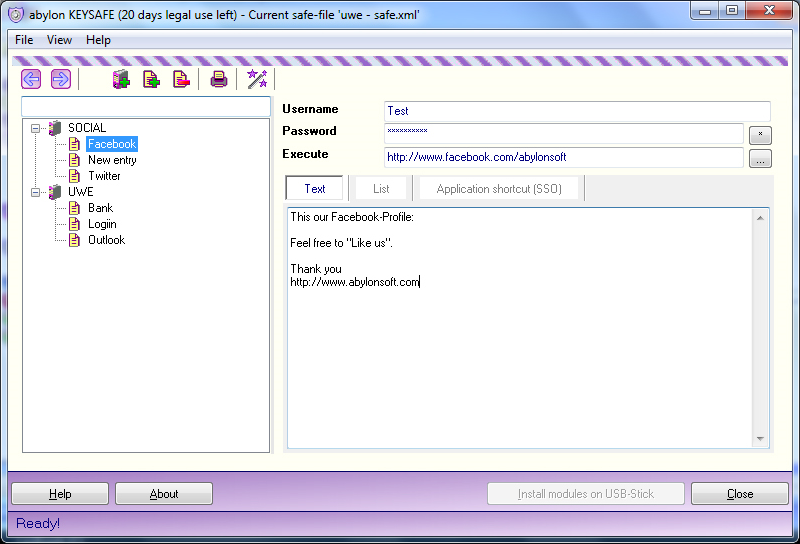 In this case we offer a corresponding 32-bit single version of Cryptmail (Link: http://www.abylonsoft.de/...mail_32bit. exe). Keysafe worked, and worked with my Yubikey, although in the Administration Settings it showed that there was no compatible usb stick available. What would be a compatible usb stick or smart card? I am looking for an alternative to Roboform, since Roboform will only sync with Android via the cloud, which is an obvious security risk, and I think some form of 2fa would be desirable for such a hot target. I was invited on each occasion when I used my Yubikey to record a long password in case of loss of my Yubikey, and it was the same password on each occasion. I think I said it provides one time passwords, but on reflection I doubt that. Is the password a copy of the pass provided by the Yubikey, or an alternative? >> Yeah, that's what I think. I found that the file encryption worked. Basic was not mentioned in the interface, but I assume that that is what was encrypting the file. I could not work out what Sharedrive was doing. I found it very attractive to have a form of 2fa for file encryption, on the assumption that it would considerably increase the security of hot data. It would be very useful if it could be available in the password manager and if that could synchronise with portable devices, so that hot data would be synchronised and better protected on portable devices. 1. As non-Americans, it is immensely time-consuming and demanding to offer a high level of encryption. I noticed that the links in the file context menu did not work on my system –the file Shredder and the Cryptassistant etc. >> Could you write what operating system you are using? Is there an error message or what does it say? I am using 32 bit xp pro sp3. With reference to Cryptmail, I do not therefore have a 32bit version of Outlook installed on a 32 bit OS. But do I need specifically to install a 32 bit version of Cryptmail? With reference to the links in the context menu, there was no error message - just an absence of any response to clicking on the links. If the operating system is 32-bit, then our software is also completely installed in 32-bit. It should not be a problem in this respect. The problem with the right mouse button menu in File Explorer under XP needs to be looked at again. We apologize for this version mess. But Microsoft does not make it easy with its version policy for Windows and Office. Noggin The Nog Thanks Thomas. Rather than reinstall the Enterprise version, I wonder whether you would be able to let me have the Net3.5 version of Cryptmail, please? I originally installed just the Enterprise version as the most direct and comprehensive way to try the programs, but would not need all of the functions in the Enterprise version. Is Cryptmail the only program you provide with the Net3.5/Net4.0 issue? On occasions when I used my Yubikey, I was invited to record a long password in case of loss of my Yubikey, and it was the same password on each occasion. Is the password a copy of the pass provided by the Yubikey, or an alternative? The easiest way to do this is to copy the download link from the english language and add the string "vc2008_". The long password is probably the emergency password (SecureID), which can be used if the hardware key is broken or lost. Noggin The Nog Thanks Thomas. Are you saying that I should copy the download link on the English webpage for whatever program I wish to download, and then add to the end of the link address the string "vc2008_" in order to download the XP version? Is the emergency password a copy of what is on the yubikey, or an independent password created by your software? The string is set before the file name of the Windows 10 Download. The path remains the same. Example:"keysafe. 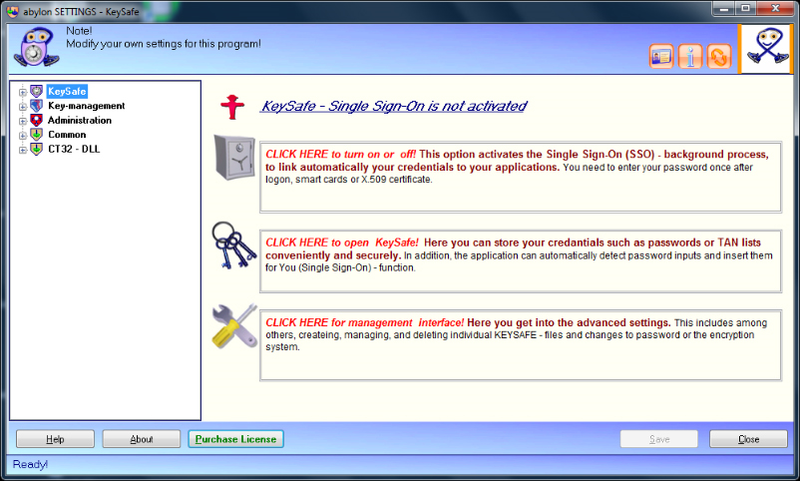 exe" and "vc2008_keysafe. exe"! Another option is to click on the German flag at the top left of the download page. If you move the mouse over the big button, a menu opens with both setups! With Yubikey I think our software recognizes it as a flash memory (presumption). 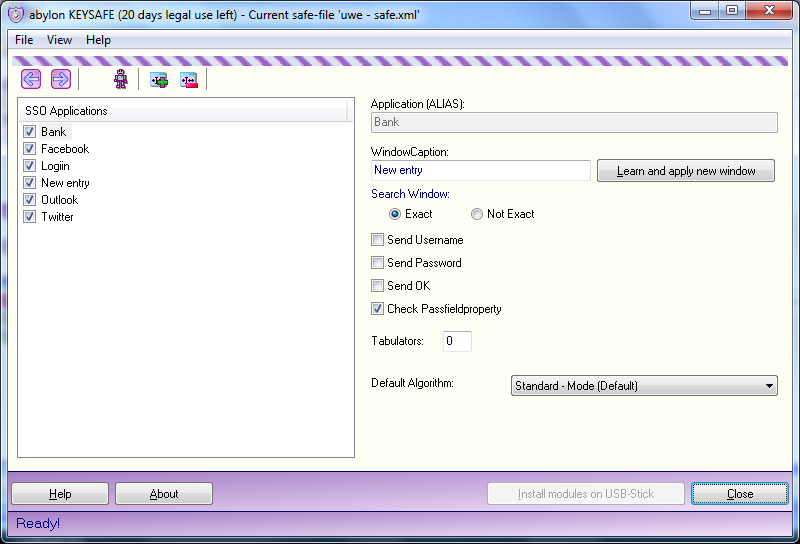 Then our software saves a file on the stick and detects certain hardware data, such as the serial number. This is commonly used as the encryption key.